Brahm's Tams Drum Circle is an informal jam of drummers modeled after a similar drum jam in Montreal. It is done for the "Love of Unity, Rhythm and Community". 2019 is the 14th year that this drum circle happens. 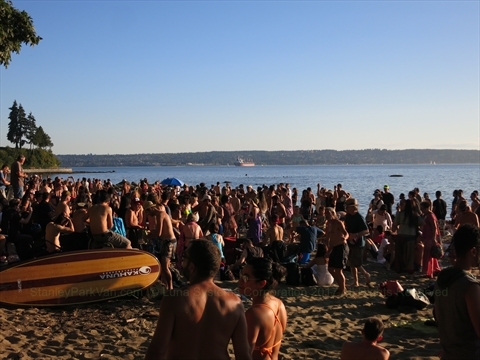 It occurs every sunny Tuesday night from March through September after work until sunset at Third Beach in Stanley Park. On nice summer evenings, there can be tens of drums and hundreds of people listening and dancing to the beats! If you are a drummer of any level, you can bring your drum and join in. If you are a non-drummer, you can also come to listen and dance! It is completely free. Note: There is usually some herb being smoked so it may not be completely family friendly. This is an unlicensed event and as such to keep it civil some rules have developed over the years. Don't smoke cigarettes or joints in or near the circle...go away from the circle to do this. 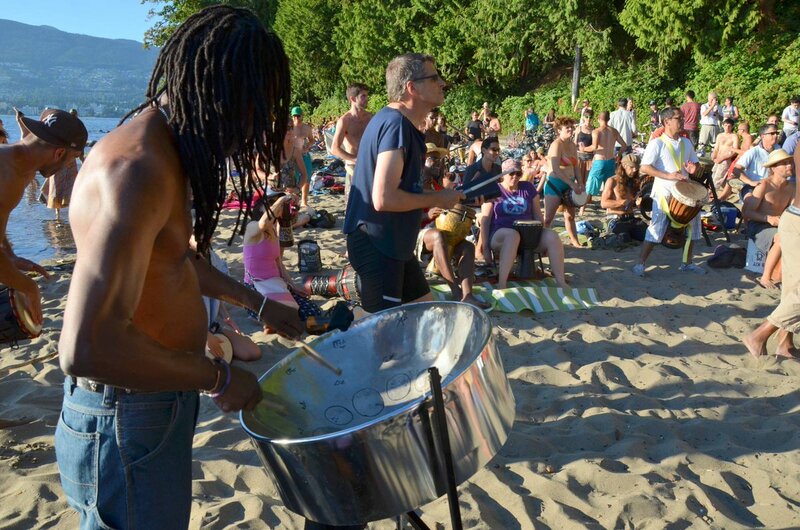 Where does the Brahm's Tams Drum Circle take place in Stanley Park? 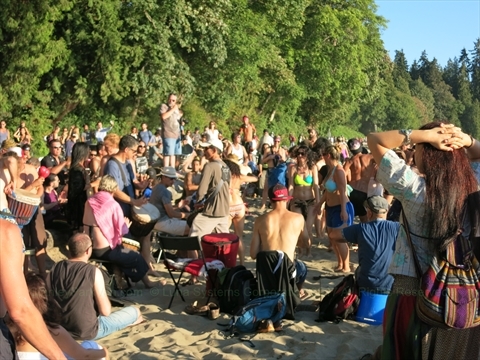 The Brahm's Tams Drum Circle takes place at Third Beach. 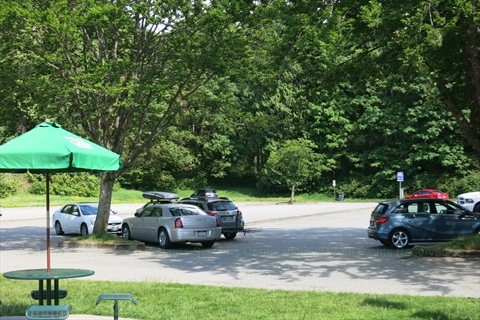 Where can you park for the Brahm's Tams Drum Circle in Stanley Park? 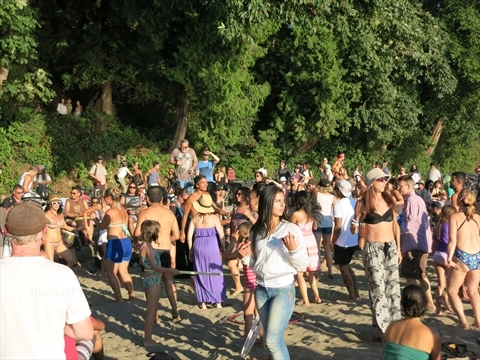 How to get to the Brahm's Tams Drum Circle in Stanley Park? 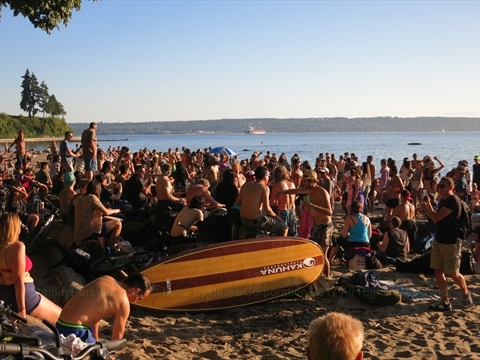 By Car: Since Third Beach is located on the west (far) side of Stanley Park, it takes some time to get to by car. To get to it by driving, get onto Stanley Park Drive via the Georgia Street entrance to Stanley Park. Take the first right in the traffic circle to get onto Stanley Park Drive. Continue along Stanley Park Drive all the way around Stanley Park past Prospect Point for about a kilometer then take the first right when you see a building (The Teahouse) on the right. Then take the next right and go down the hill to the Third Beach parking lot. Note: you can go up Pipeline Road, the second right at the traffic circle to shorten the journey! By Walking: From Second Beach / Ceperley Park: 1) walk west along the Stanley Park Seawall until you reach Third Beach. 2) Alternatively, take the path across the road behind the Second Beach Concession Stand into the woods, turn left onto Rawlings Trail, then continue for a few kilometres until you exit the forest at the Teahouse restaurant then go down the hill to Third Beach. By Bicycle: From Second Beach / Ceperley Park: Take the path across the road behind the Second Beach Concession Stand into the woods, turn left onto Rawlings Trail, then continue for a few kilometres until you exit the forest at the Teahouse Restaurant. Go down the hill to Third Beach. You can return to Second Beach via the Stanley Park Seawall bicycle path. By Bus: You CANNOT get anywhere close to Third Beach by public transit. 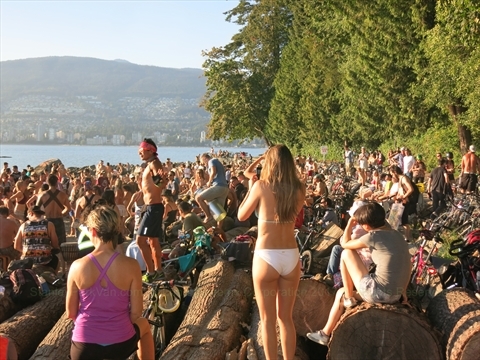 What else is located near the Brahm's Tams Drum Circle in Stanley Park? 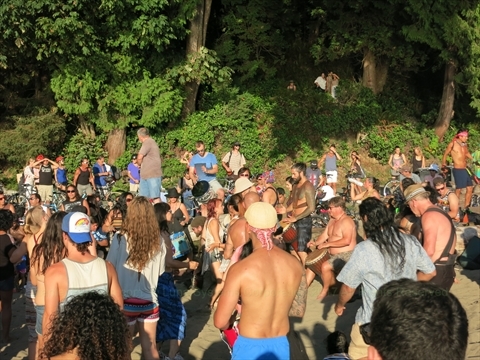 The Brahm's Tams Drum Circle happens at Third Beach. Nearby is Siwash Rock and the Stanley Park Seawall. Additionally, there is a concession stand above the beach if you get the munchies!